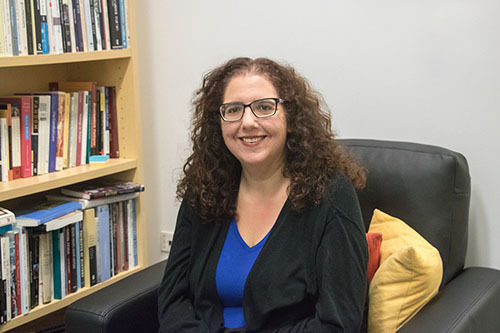 Jodi Eichler-Levine is an associate professor of Religion Studies and serves as the Berman Professor of Jewish Civilization. Her work is located at the intersection of Jewish studies, religion in North America, literature, material culture, and gender studies. She holds a Ph.D. in Religion from Columbia University and a B.A. in Near Eastern and Judaic Studies from Brandeis University. Before coming to Lehigh, she spent eight years as a professor of Religious Studies and Women’s and Gender Studies at the University of Wisconsin, Oshkosh. Professor Eichler-Levine is the author of Suffer the Little Children: Uses of the Past in Jewish and African American Children’s Literature (NYU Press, 2013), which was reissued in paperback in 2015. In this work, she analyzes what is at stake in portraying religious history for young people, particularly when the histories in question are traumatic ones. Her publications have also appeared in American Quarterly, Shofar, and other journals. Additionally, she has written for The Washington Post, The Immanent Frame, AJS Perspectives, Kveller, Religion Dispatches, Tikkun, Religion in American History (where her work was also featured), and the Christian Century Then and Now blog. As an affiliate of the Berman Center for Jewish Studies and the Director of American Studies, Dr. Eichler-Levine’s teaching encompasses a wide range of topics, including Jewish comics and graphic novels, religion and food; religious children’s literature; modern Jews; Jews, gender and sexuality; and religion, sci-fi, and fantasy. On the national level, she has served as the co-chair of co-chair of the Association for Jewish Studies Women’s Caucus of the American Academy of Religion’s Religion, Memory, History Group. She remains on the AAR's steering committees for Religion, Memory History and for Childhood Studies and Religion. Future projects include a book length work on Jewish women, material culture, politics, and performance, currently titled Crafting Judaism:Creativity, Gender, and Jewish Americans. Professor Eichler-Levine also continues to write on Jewish children’s literature and on popular culture, race, ethnicity, and religion in the United States. When she is not wearing her professional hats, Professor Eichler-Levine enjoys knitting, sci-fi and fantasy series (all-time favorite: Buffy the Vampire Slayer), the Boston Red Sox, and the Green Bay Packers. She lives in the Lehigh Valley with her husband and daughter.